Conference is the most widely-grown pear variety in the UK. It crops heavily and reliably, and will grow in most situations. It is also one of the few pear varieties to be reliably self-fertile in most situations, so you don't usually need another pollinator nearby. Furthermore it is a good pollinator for many other pears. The skin is usually partially covered in golden-green russet. A home-grown Conference pear, picked just before it is fully ripe, has an excellent flavour that should not disappoint. Please fill in the details below and we will let you know when Conference pear trees are back in stock. Related to Conference, a bit less productive but better flavour. Conference is in flowering group 3. Conference is self-fertile and does not need a pollination partner, although fruiting may be improved if there is a compatible tree of a different variety nearby. Since it flowers in the middle of the blossom season it can be pollinated by most other pear trees. Conference is one of the easiest pears to grow, being less fussy than some other pear varieties, tolerant of late frosts and strong-growing. 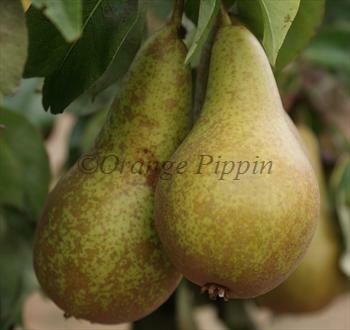 It is by far the best choice if you want to grow a pear in less than ideal conditions. Unusually amongst pears, Conference is effectively self-fertile. However nearby pollination partners will help cropping - try Doyenne du Comice or Williams. Conference will also pollinate some late-flowering Asian pears which overlap with its flowering time. All pears tend to grow with a vertical habit, but this is particularly the case with Conference, which can have a distinctly columnar upright appearance. Conference was developed by the Rivers Nursery of Sawbridgeworth, Hertfordshire, in the second half of the 19th century. It is thought to be a seedling of a continental variety called Van Mons Leon Leclerc. It was named after the National British Pear Conference held in 1885.